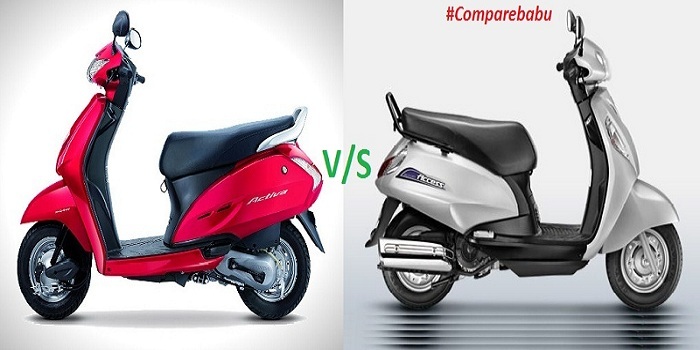 Compare Activa 3G, i, 125 Vs Suzuki Access – When it comes to the competition of two Japanese contenders, then the game becomes very interesting. Suzuki’s Access has become one of the fastest selling scooter in India and it is giving a very tough competition to Honda’s Activa series’ scooter. Even if the game might look inclined towards the Honda Activa, we cannot overlook what Suzuki’s Access has to offer. Access 125 is available at INR 51,448. The new 2016 special edition is costlier than the basic model. The new model costs INR 58,000. In Delhi, Activa 3G’s ex-showroom price is INR 49,900. Mileage is 42-52 kmpl for Activa 3G. Access has a mileage of 40 to 50 kmpl. Mileage is comparable in both the cases. Activa 3G has a capacity of 5.3 L fuel whereas Access has fuel capacity of 5.6 L.
In terms of cc engine, Suzuki’s Access is a crystal clear winner. Access 125 flaunts 125 cc engine whereas Honda Activa 3G’s engine has a displacement of 109cc only. In terms of top speed as well, Suzuki Access is more favourable. It has top speed of 92 kmph whereas Activa 3G has a top speed of 85 kmph only. Ex showroom price of Activa 125 Dlx is around INR 60,500. Access 125 is available at INR 51,448. The new 2016 special edition is more expensive than the basic model. The new model costs INR 58,000. Activa 125 has a mileage of 50 to 55 kmpl. Suzuki Access gives a mileage of 40 to 50 kmpl on Indian roads. The fuel tank capacity of Honda Activa 125 is 5.3 L whereas the fuel capacity of Access is 5.6 L.
If cc is compared, then both have same cc engine. Both the scooters have 125 cc engine. So, this cannot be a deciding factor in understanding which scooter can be better than the other. Activa i is available at a price of INR 47,000 in Delhi ex-showroom. Access 125 is available at INR 51,448. In terms of mileage, Activa I gives a great mileage of 66 kmpl whereas Access 125 gives mileage of 40-50 kmpl. Here, fuel tank capacity does not matter much as the better mileage is compensating the fuel tank capacity of 5.3 L when compared to Access’ 5.6 L fuel tank. Activa I has not been designed for cc lovers. It has only 102 cc engine whereas Suzui Access flaunts 125 cc engine. In terms of top speed as well, Suzuki Access is much better. It has top speed of 92 kmph whereas Activa i has a top speed of 82 kmph only. Verdict: This can be tough as Suzuki has really played a gamble here. If you are thinking to buy a 125 cc scooter, then you should go with Suzuki Access. The price of Suzuki Access is lower than Honda’s Activa 125 model. In other cases as well, we feel that Suzuki Access is much better in other areas as well.